We landed in Florida, walked into the Magic Kingdom….and I instantly became obsessed with the “Autumn Time Mickey Wreaths” adorning Main Street USA. After talking to a fellow wreath admirer in the confectionary, I quickly learned that many want to buy these wreaths for their home but Disney doesn’t sell them. What I cannot buy, I make…and what I make, I share on this blog! 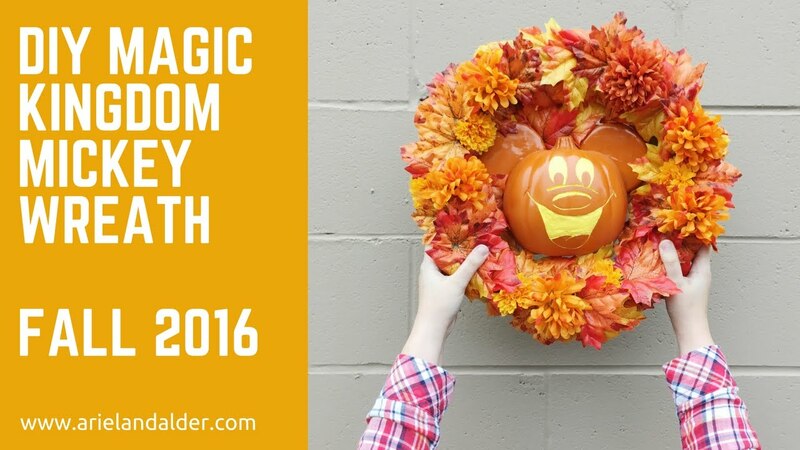 Here is how you can make your very own Main Street Mickey Wreath! Disclaimer: This is not a quick project, it took me a week of spare time and a few tries. Be patient and give ample time for everything to dry. 1. Slice the craft pumpkin directly in half, This takes some serious arm work so ask a friend for help so you don’t slice your fingers off. 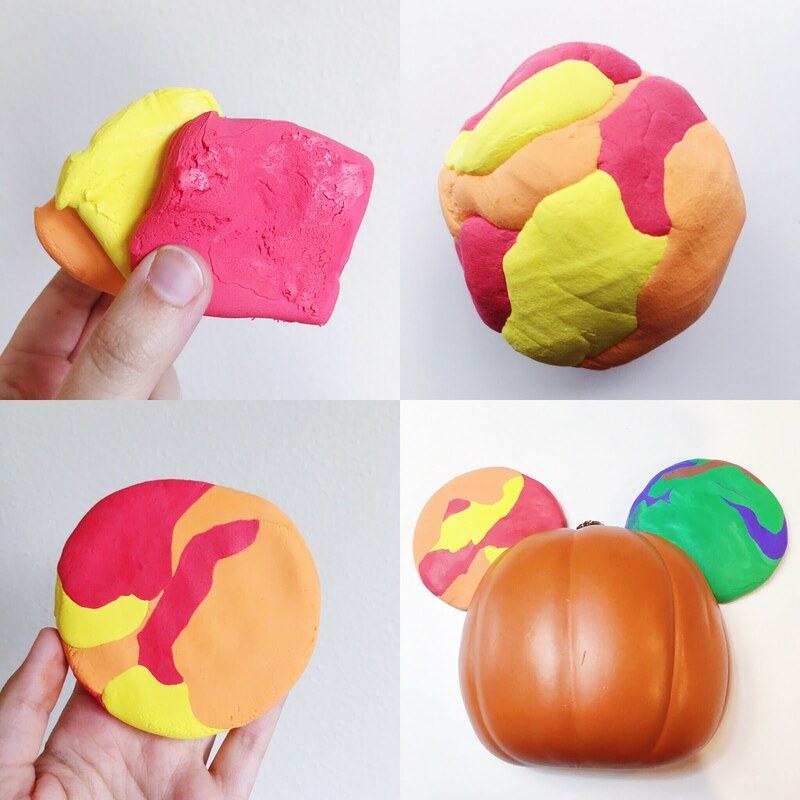 Pick the better half for the face of your Mickey pumpkin and either recycle or throw away the remaining half. 2. Probably the most difficult step of this project, you will need to carve the face into your craft pumpkin using an Xacto knife. My best advice is to stencil out your face with a sharpie and then begin carving from there. NOTES: This step is seriously messy and may take awhile. Carving mine out took a few days of sitting in front of the TV and carefully carving away. You are done when you are deep enough to have a 1/4th inch crease, but be careful not to carve through the foam! 3. Paint the creases and space you have carved yellow, coat twice. 4. Now you will need to form the ears! I used Model Magic for this because it dries lightweight and is easy to form. There isn’t really exact instruction for this, just combine three packets (colors) of clay and form each ear. To make sure that they would fit on my pumpkin head I let them dry around the left over pumpkin half. 5. Once the model magic is completely dry (48 hrs) spray paint the ears orange! Use quick light sprays in a well aerated area until ears are completely coated. 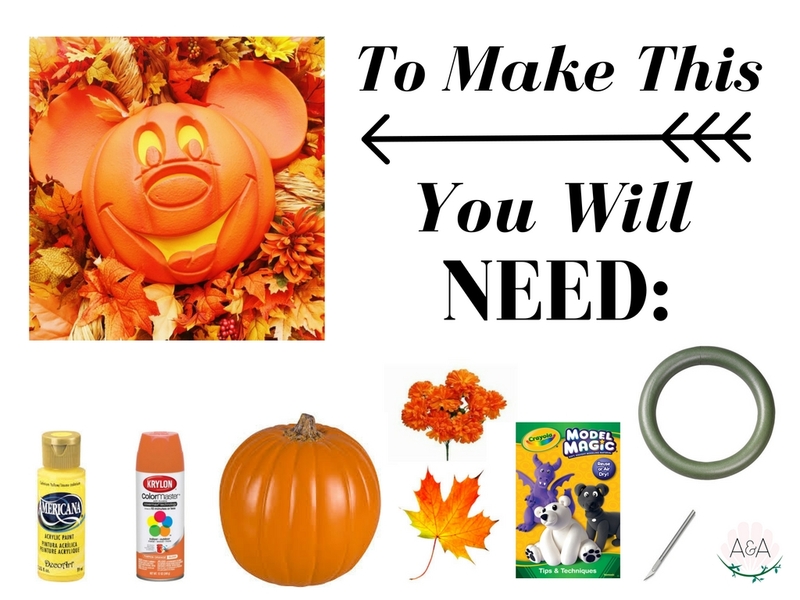 Glue the ears on to the pumpkin head and you are done with Mickey Mouse! 6. To form the wreath you can go one of two routes, floral pins for temporary placement or hot glue for permanent. I went the hot glue route out of fear that the wind on my balcony might send leaves flying. There wasn’t a super “set” way to do this, I just started placing leaves and flowers until it looked right and glued everything down. Save some leaves and flowers for the very end. 7. To attach the mouse head to the middle of the wreath glue the pumpkin back to a piece of cardboard, then glue the cardboard edges to the back of the wreath. Make sure everything is sturdy if you are putting it outside. 8. To get this wreath to look as much like the Disney Parks original as possible, fill in the remaining space with the extra leaves and flowers. The space between the pumpkin and the wreath should be completely filled in. 9. Hang it, and wait for the complements to roll in from your neighbors 😉 You are done! If you give this a try, tag me! I would love to see it! 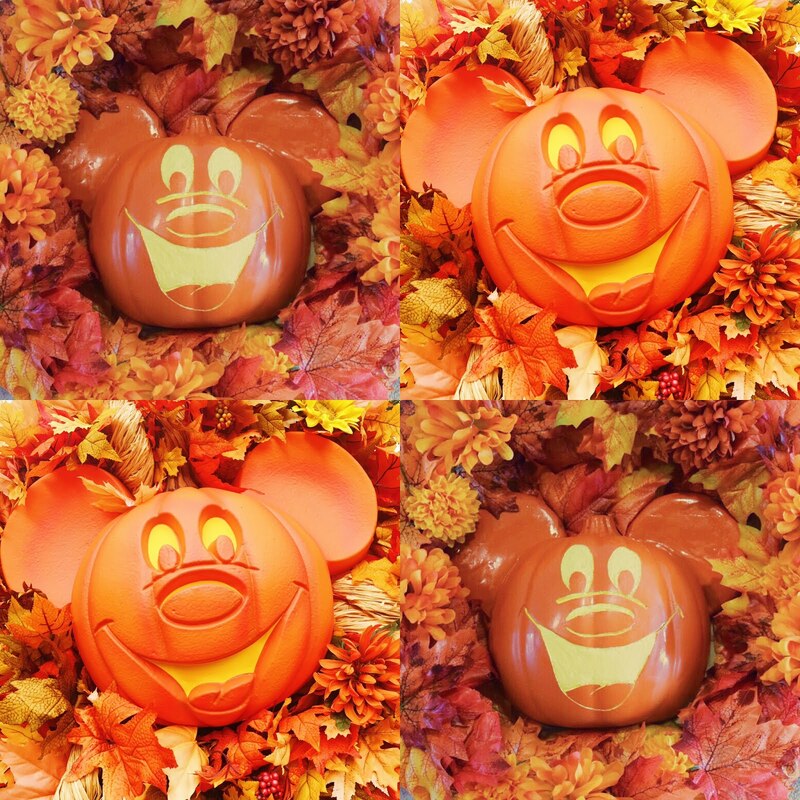 Separator image Posted in Disney, DIY, Halloween, Holidays. Can We Keep The Leaves?